So the pickings at my house right now are pretty slim. I’m doing my best to not just run to the grocery store weekly to buy what I “want” to eat, rather than what I have in the house. 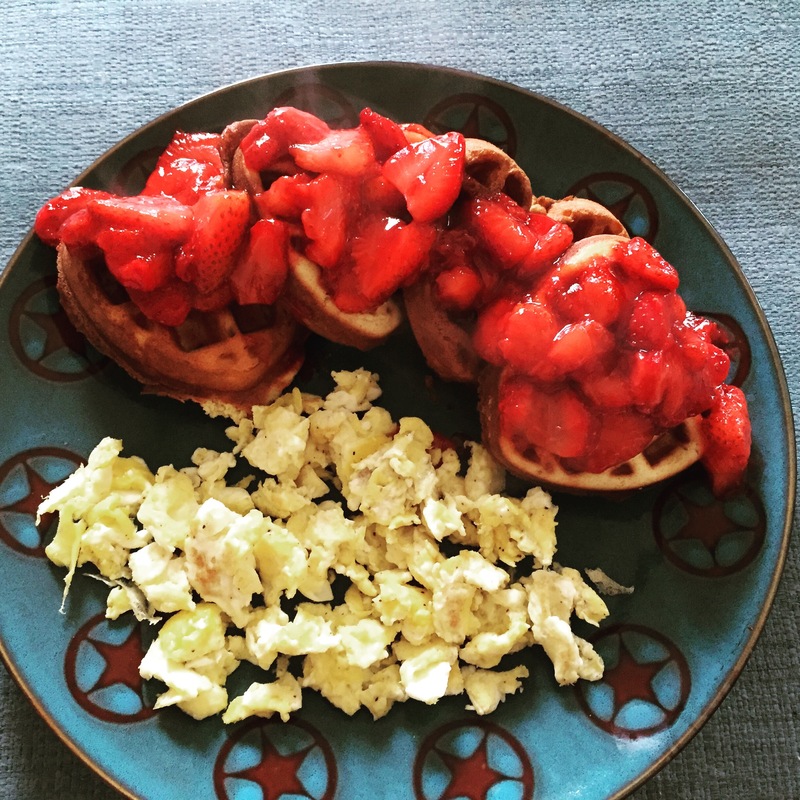 So this morning in an effort to make something different with what was in the house I made Strawberry Waffles and Scrambled Eggs. It actually turned out pretty good. I have to give Pinterest the credit for this meal because the me before Pinterest existed, would have never been able to make this. Even though it’s super simple. I’m almost ashamed of the ingredients for this breakfast because I would love to tell you that it was all from scratch and all organic, but that was not the case, actually not even close. So start out by cleaning and cutting the strawberries. Mine were starting to go bad and so I needed to get rid of them. Making a sauce with them is perfect because you can’t tell that they were a little soft when I started cooking them. Set the strawberries aside. Mix the cake mix, oil, and eggs in a medium bowl. I had to play with the oil to cake mix ratio a little bit to get it the consistency of waffle batter. One you have it all mixed up, spoon the batter into the waffle maker. Because the batter is a little thicker than normal, make sure you have the maker on a lower setting (mine was on 4) and that you don’t over fill the waffle slots. If you fill them up too much then they won’t cook all the way through. Also because they are thicker I had to cook mine for a cycle and a half. So once the buzzer goes off, keep them in there for a few more minutes. It may take you a couple times to figure it out. Once you have those started and figured out you can start the strawberry sauce. 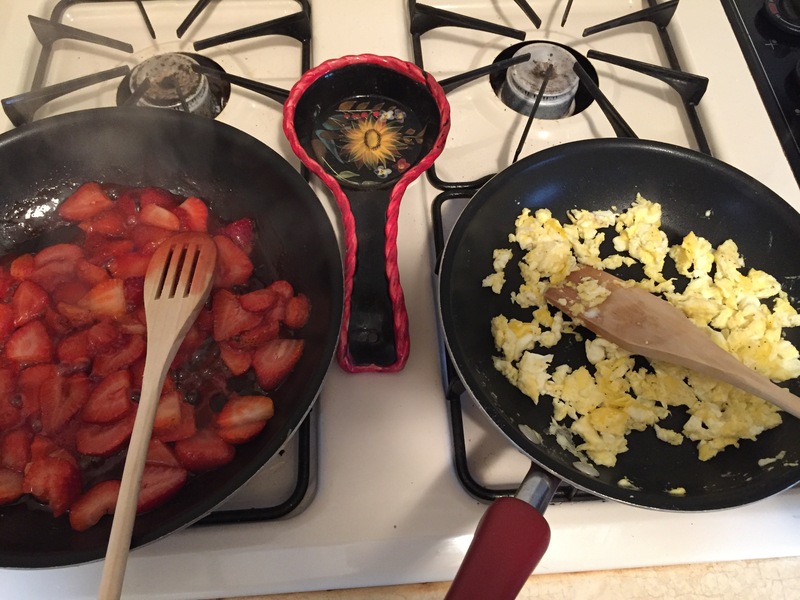 To make the strawberry sauce put the strawberries in a small frying pan over low heat and sprinkle with 1 Tablespoon of sugar. Let the strawberries cook until they have a sauce like consistency. You will need to mix the sauce every couple of minutes. Once you have finished all of the waffles set those aside (I put mine in the microwave to keep warm) and start the eggs. Most people probably don’t need instructions on how to make scrabbled eggs but just in case you do (like I would have needed about 5 years ago) here they are. Add a 1/2 tablespoon of butter to the pan and break the eggs in a small frying pan on low/medium heat. Then scramble with the spatula and season with salt and pepper to taste. Keep scrambling until cooked through. If they brown too much then you have the flame too hot. Once the strawberry sauce is a saucey consistency then you are done. Place the the waffles on the plate, poor the strawberry sauce on top and serve the eggs on the side. It took me about 15 minutes to make. Previous What if I told you….